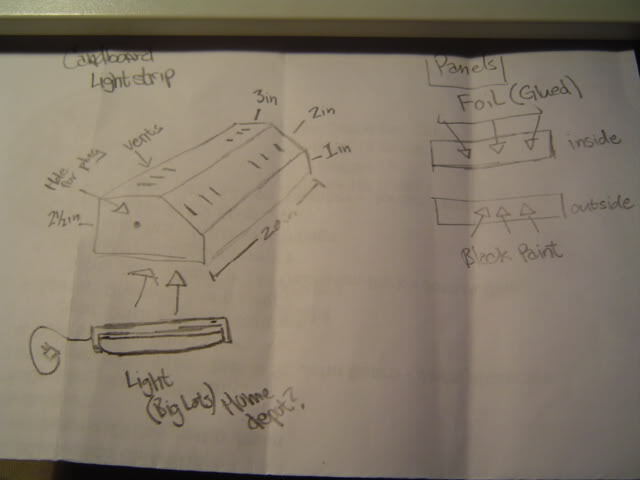 im trying to make a lightstrip out of stuff that i can find around the house..hopefully itll turn out good ..will it be safe to make one out of cardboard? im kinna iffy about it cuz i dont know if it would catch on fire or something ..maybe im being a lil paranoid? ..i dunno.. well heres the plans ...think itll work? Do not use cardboard! Cardboard breaks down when it gets wet, and being above a fish tank is not the best place for something to be unless it can get wet. I agree 100%. I would not recommend using cardboard at all. You could probably use high density fiberboard if you coated it with a good grade of polyurethane. Another option would be lauan board which is a thin plywood...about the thickness of paneling. I have made a couple of PC fixtures using sheet aluminum and that seems to work well. Your plans look fine if you can substitute the material for something more durable. cardboard and foil. that's two strikes. i agree with loganj - the plans look good, but the materials must change. i mean, come on...cardboard? seriously? i hope you have good fire insurance. 1/4" plywood isn't expensive. if you're going to home depot for the lights anyways, spring the extra $6 for a 4x2 sheet of 1/4" birch or oak. also use mylar or white exterior paint instead of foil.